Getting tired of wearing the same old accessories over and over again? There's an easy and inexpensive fix for that. Try making some new headbands, scarves, or jewelry with just a few pieces of fabric or by refreshing some stuff you already have. Don't know how to sew? That’s no problem. 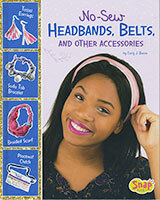 Each activity in this book provides easy step-by-step instructions to make your own accessories without ever having to pick up a needle and thread.